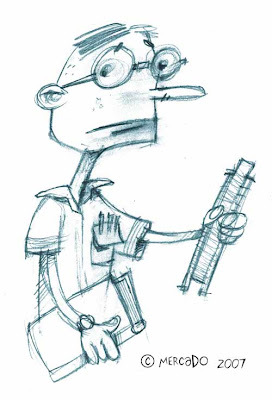 Here’s a quick sketch for this week’s IF theme: Geeky. He’s complete with the ‘ol pocket protector and tape on the glasses. Now how many of you remember the slide ruler. Huh? That’s one apparatus that’s a little before my time too (hard to believe). Have a good week everyone.